This iron is treacherous and by that I mean dangerous! I bought this iron at Canadian Tire - a bit less than $50 on sale. My husband irons his shirts almost every morning and my 15 yr old irons about 1-2 times a week. I used to love ironing. The placement of the cord attachment and the angle make it very difficult to balance on it's end (like people do so often as they rearrange the clothing they are ironing on the board). I have tried moving my ironing board to many different rooms thinking it was off level. I have made my board as stable as possible and it too is relatively new and still any bump to the board and the iron is teetering or worse falling down on to usually partially dressed individuals. 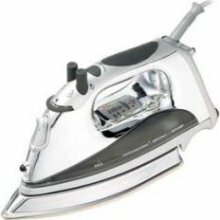 I now can't let my son iron for fear of a bad burn, it makes me and my husband foul when we have to iron and I am trying to decide if I should spend almost as much as the iron for a special attachment to the end of my ironing board to house it while we shift the clothing or if I should just get a new stable iron. I don't have room to set up a permanent ironing location with 3 kids and a big dog so whatever I get has to collapse with the board easily. Oh yeah, it does get hot, I like the steam & settings but feel like I am ironing on a tight rope. AND I did search consumer reviews before I bought it. Nobody mentioned this. The design is unbelievable!! That's what I need. I like everything futuristic. Besides, it will be useful for the case study I'm working on right now.